Panzer War is a World War II tank miniatures game rules system. Airland War is a Modern Combat tank miniatures game rules system. Seas of War is a WWII naval miniatures game rules system. 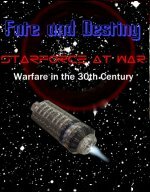 Fate and Destiny is a science fiction miniatures game rules system. Panzer War has been made into a computer game Panzer Command: Winter Storm by Matrix Games. 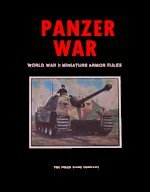 The first Panzer War rules set was published in 1979. A production run of only 250 sold out in the next two years. The second version is the one most people who have played it are familiar with. Panzer War (II actually) was a well produced multi-colored version and was published in 1981. The data charts over the next ten years have been updated as new information came to my attention. About 1,000 copies of this rules set were produced and this is no longer available. Lessons learned with the system led to the modern version called Airland War, published in 1990. Thanks to the Cold War ending this did not do as well as Panzer War. This system also is no longer being sold. In the intervening years the improvements in the game system were made and a play test version called Panzer War III has been played since around 1993. However, it was never published as it became much more complicated. I had plans on writing my own computer version of the game to handle all the bookkeeping. Well, I never got around to do that (since it is more lucrative to write software that does other things) but gamers still need a rule set. So this site will be dedicated to distributing a free version of the game. That's right. This entire rule set is FREE . This is not a stripped down version of something we want you to buy. Note - Panzer War and Airland War are copyrighted material. All rights are retained by the author, Steven Lorenz. These rules can be freely copied and distributed in order to play the game. However, no fee may be charged over and above that to cover the cost of reproduction and distribution. Nor can an electronic version of these rules in the form of a game using the material herein as a basis be sold commercially. In other words anyone is free to copy these pages as much as they want they just can not produce and sell a product copied from these pages. At Origins 2006 Panzer Command was released. This uses Panzer War data and rules as a basis. If you can't find players for a miniatures game a computer version is your next best choice. Copyright infringement is a serious offense, which can result in civil and criminal penalties under the United States Copyright Act, 17 U.S.C. §501 et seq. The civil remedies provided to a copyright owner include statutory or actual damages. Actual damages are the owner's lost profits, or the infringer's profits from the illegal use of the infringing copy. 17 U.S.C. §504(b). The statutes provide for damages of not less than $500 per infringement for an innocent infringer, and up to $100,000 per infringement if the infringement is willful, regardless of the actual damages. 17 U.S.C. §504(c). In addition, the copyright owner can obtain an injunction against further infringement, 17 U.S.C. §502, and attorneys' fees and costs, 17 U.S.C. §505. Also, serious criminal penalties exist, including fines and imprisonment, 17 U.S.C. §506. If a message box pops up asking for authorization just press the Cancel button. Panzer War is a set of war game rules simulating World War II armor warfare in the most realistic and accurate manner of all rules. The game is designed for play with 1/285 scaled models. Each player can assume the command of a platoon or company of troops. Panzer War includes rules covering weapons, tanks, armored vehicles, troops, trains and planes used during the conflict from 1938 through 1945. The scale being one vehicle model for one real vehicle and one infantry stand per infantry squad. Panzer War may seem complicated at first once the basic rules are understood and experience is gained they will become second nature to the players. After familiarizing themselves with the basic rules players should move on to more advanced rules one step at a time. Most players come to Panzer War after they have graduated from some other introductory system. Besides scale vehicles and troops players must acquire a metric measure, a six side die (D6) and at least two ten-side dice (D10). Additional equipment such as scale houses, trees, buildings, bridges and terrain boards can be used to enhance the look of the game. In fact it may improve play to use either sand tables, terrain boards or carpet/felt playing surface. Additionally clear acetate overlays may be required to be made of artillery effective areas. While the game was designed to be played in either 1:2000 or 1:1000 ground scale with 1/285 scale models there will be a set of companion rules to allow for play in other scales. These others scale are played at 1:250 or even 1:100 scale using 15mm or 25mm scale models. All distances will be given in Game Scale Units (GSU) so that no calculations have to be made. Players should be familiar with the metric distance system as all measurements are in this system. If the rules say something moves '100' then all that has to be measured is 100 millimeters no matter what scale one is playing at. Since models are considerably out of true scale measurements between figures should start from the center of the measuring unit to the edge of the turret or superstructure roof or troop base.